Marriage takes work. Sometimes it takes a move to Italy to make it work. Susan Pohlman and her husband Tim took some dramatic steps to save their strained marriage. They sold their California home, left most of their belongings in storage and made a bold, spur of the moment decision to spend a year living in Nervi, a small town in Italy. The simple life there helped strengthen their faith in God and drew their family together again. 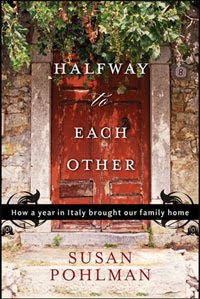 Susan shares her experiences in her new book Halfway to Each Other: How a Year in Italy Brought Our Family Home . Pohlman's memoir inspires others to clean out life's clutter and focus on what matters most - family, friends and faith. Each chapter offers a snapshot of her life in Italy and recalls special moments with her husband and her two children, Katie and Matt. The everyday family moments - the time picking sea glass, ice skating, doing laundry, evenings sweating together in a hot apartment - those are the moments that brought clarity to their lives and pushed them together. Life in Italy wasn't exactly easy for Pohlman's family. They went to live there knowing only basic Italian phrases. Each family member experienced fear and anxiety. But, along the way they made some good friends and relied on each other, working as a team instead of as opposing sides. Most of us would never take such drastic measures to find happiness. However, most marriages are filled with stressful times and Pohlman, in her book, discusses the benefits of slowing down the hectic pace of the typical American lifestyle. The book made me want to reassess my marriage and family life and live more simply. Pohlman's observations (sometimes humorous) of the differences of life in Italy, the food, the Sunday family days and the transportation were the most interesting to me. I haven't been to Europe but would love to visit someday. A Guideposts publication, the book includes a few Christian references. The importance of family time is a major theme and that's something we should all take to heart. Forget the things, the gadgets, the big houses. The kids won't remember them. Later on they won't mean much to you either. What you will remember is the time spent together and kind gestures made out of love for each other. Guideposts Article: "Estranged Married Couple Finds New Love in Italy"
This book sounds interesting. I hardly read a memoir but I may give this one a try.